She’s a flirt and the worst sort at that. This Black is heartless, or that’s what all the boys think anyways. A bat of her lashes and a swing of her hips, and she’s got the boys eating out of the palm of her hands. Not that she wants any of them. She’s the Demonhound that’s leading everyone on chases, but never picking a winner. She knows she's got power over the boys and she likes it, more than the boys themselves. They just spend all their time trying to impress her just for their seven minutes in heaven. For once, she'd just like to meet some nice guy that likes her for what's inside rather than out. Not that he exists, though. If she can't get what she wants, neither can the boys. This Black really isn’t heartless, she’s just jaded. She’s a romantic trapped in the body of a maneater. That’s why she’s so cold. Feminine and ashy just like her rank twin, the main difference is in the expression, the stance, and, well, the stones. The stones at the corners of her eyes have an interesting luster. Green maybe. Or purple? The pearlescent color changes with the light she is in, as do her wings. The girl is a black pearl. And she’s knows she’s coveted. It’s in her walk, the way she slowly shakes her hips with each step. It’s in her icy eyes, heavy-lidded so she’s alway looking through her lashes. Her breathy voice could make anyone’s heart flutter. Everything about her screams, “here, I am boys,” without really trying. She’s naturally a sultry creature and if you ask her. She kind of hates it. Not that she isn’t going to flaunt what she’s got, because why not? In some ways you could almost consider her a hoarder, though she's not so much interested in having stuff as she is in collecting certain numbers of things. She'll happily share with you a little bit of money or perhaps this nice enchanted headband if you'll bring her six tennis balls or find her ten lost squeaky toys. She may even have you walk her three times around the weyrd, or you might find her trying to get you to run up and down the stairs ten times. There doesn’t really seem to be any kind of pattern to what she wants, except that it’s in a much greater quantity than you would think that she could actually put to use, but the real mystery is where on earth she manages to get all the little rewards that she has for you if you complete her tasks. She’s so cheerful and excited about her little tasks though, and she really doesn’t mind helping you complete them if you ask her nicely, and she’s just so cheerful about the whole idea that it’s hard to say no. If you do manage it though, well don’t be surprised if you pass by and find a group of Firelizards carrying eighteen tennis balls between them. A big dark brindle girl she tends to look a little disorganized, but you’d be a little frazzled too if you had as much stuff as she did to keep track of, not to mention keeping note of how many people she has sent out on one quest or another to find her more stuff. Her long, shaggy fur is a dark grey color, shiny and clean despite how unbrushed and unkempt it tends to look at times, and broken up with streaky flashes of brown and tints of white in no discernible pattern at all. Her larger wings, accommodating her somewhat larger body, are a soft and velvety shade of black, glittering with bright black stones that glitter in the right sort of light. Her eyes are a bright and pretty gold, breaking up the dark coloring of her body. Personality: Summer in the winter. It's not that strange of a concept, as many people often bundle up and sip their hot chocolate, waiting out the cold and dreaming of warmer times. This petite creature is the embodiment of such dreams, an almost too beautiful vision of fond memories and hope for the future. She is gentle and soft-spoken, a willing follower that will take charge only when she has to. It is fun, to be without the responsibilities of a higher rank, and she intends to keep people looking on the brighter side of life, to bring them enthusiasm and love no matter how cold a season it is in their hearts. With a wise tongue and an innate, perhaps naive friendliness towards all and she could be a fine, helpful member to any bond's family. A flirt she can be, but never expect more than a one time stand as summer is fleeting and never lasts forever. A lingering glance or the brush of her fur will remind you that she will return to your side again one day, but you must be patient. 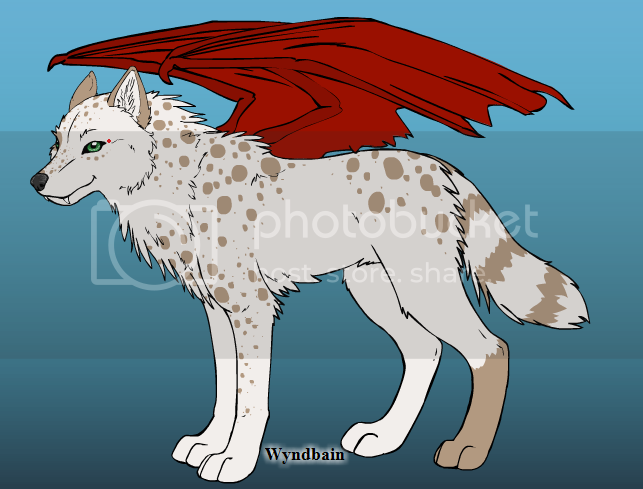 Description: She is a relatively small Red even for her rank, with a short, stocky build that makes her short fur seem heavier than it really is. Her body is a well-rounded mix of muscle and fat, the perfect shape to make her healthy and active. She's not some athletic nut, but she's no slug, either. Hard work pays off as shown in her fit form. Her nose is a sooty black, matching her claws and the edges of her eyes. The rest is quite an unusual but lovely combination of colors. Like a sunrise over frozen peaks her body is wrapped in cold an unforgiving snow that shimmers and melts from soft golds up her limbs and into rusted orange splendor. This color darts over her ears and head, dripping down her muzzle and gently masking eyes of the palest blue. Her wings are long and flexible, gently sloped to yield a shape more akin to a swallow's than some fat Dragon's membranes. Sinopian in color, they mirror her ties to the earth with rich deposits of Carnelian red swirling across the edges, the same hue that dots the tiny sparkles on either side of her eyes and on her wing tips. Extra: Her left ear is pierced, with a tiny pearl snowdrop flower dangling as a quiet reminder that warm times are on their way. Description: Of a medium size and slender build for a Red, this gal certainly is built to be pretty. And a pretty Penny she is! With a white coat that is very neatly kept, she exudes something of an innocence. The only other color on her pelt is a pale tan which freckles up her face, down her back, her chest, and her left front leg. Her tail lacks the spots and instead is striped, not unlike a raccoons in the same color, and her back left leg is socked in tan. Another splotch of the color encompasses her right eye in a patch, which certainly makes her vibrant green eyes glow in their radiant, optimistic way. Her eye-corner gems are a nice crimson color, marking her rank, while her velvety wings are darker, sort of a rose-hued red. It’s easy to see why she’s caught the eye of some Golds, despite being a mere common female, she really does put off a smile that tells you she’s special. Personality: In a word, Penny can be described as altruistic. She hasn’t had the absolute best of lives, being a wild shiny who has always dreamed of having someone to truly love her, but she never worries about herself before she’s worrying about others. If every other wild shiny could find a home, she’d be perfectly happy living out her days as the one wild one left. That’s not to say she’d deny herself the chance if it came along, but her focus will always be outward instead of inward. She’s an optimist through and through, believing in the absolute best of people. Show her someone terrible and rude and she’ll try and tell you everything she sees that is great about them. Of course, while perhaps seeing a touch naïve, she’s not truly obtuse. After a while, if someone is consistently awful to her or to others she will become disillusioned and reevaluate her previous opinions, which will be disappointing to her, but ultimately for the best. She’s the sort of shiny who will happily engage anyone in conversation or just listen if they need her to. She can be a little dazzled by first impressions, grand gestures, or by false images intentionally thrown up by bad people, but ultimately she’ll always find the truth. Whether or not that ends in tragedy for her is yet to be seen, but surely there is someone out there who would love to love her for who she is.